Discussion in 'The Doctor's Clinic' started by Indi-Shii, Dec 9, 2010. A friend dared me to make a competitive team including only unevolved Pokemon, and I'm happy with the movesets for five of them. I have this Mudkip, though, that I just don't know what to do with. Help, please? I have access to all moves and items from Diamond and HeartGold, and my only restriction is that I can't evolve this little guy. I start off with Toxic to slowly chip away at the enemy, then use Double Team until it's virtually impossible to get a hit in. Waterfall is there for STAB, and Bide is really just a placeholder until I can get something better in there. Double Team is banned from use pretty much everywhere for one thing, so that throws that out the window right off the bad. 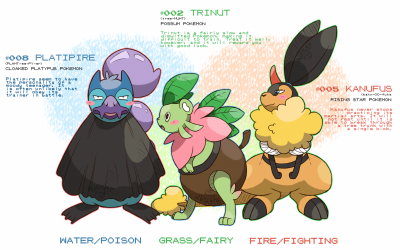 Also, even if it wasn't banned, this set would still fail miserably since Mudkip is likely to be killed in a single hit by everything it faces anyway, preventing you from even getting off Toxic let alone the numerous Double Teams necessary for this set to be...well, usable but still bad as opposed to utterly useless. Sash is absolutely mandatory for Mudkip in a competitive setting where he'll be facing off against fully-evolved Pokemon because he's likely to die to everything that's used on him - note that Stealth Rock and other entry hazards will ruin this, so Rapid Spin is also essential unless this Mudkip leads (which isn't too far out of the question.) Counter is the KO-stealer here - with HP training your Counter will be strong enough to OHKO even Snorlax if the attack triggers your Sash, and if you're against a weaker opponent HP training will give you some chance to survive the attack even without the Sash, preventing this set from being useless if the Sash is broken by entry hazards. Endeavor you'll want to use when your HP is almost 0 - it'll drop the opponent's HP down to match your own, which could very well leave them with 1 HP if your Sash is triggered. Yawn works well with this too - Yawn a Pokemon as it hits you, dropping to 1 HP, and they can either stay in and KO you only to fall asleep that turn, or switch out and have the Pokemon brought in dropped to 1 HP instantly by Endeavor. Protect is for lack of anything better really, and it lets you scout your opponents to see what moves they're carrying, making the guessing games a fair bit easier on you. This is the only way an unevolved Pokemon can hope to succeed competitively unless you're using something like Onix or Scyther.